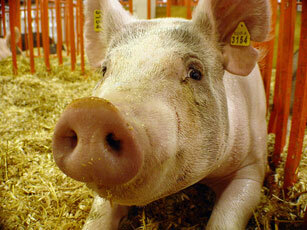 ‘Swine’ flu has the pork industry worried. The World Health Organization said on Thursday that it will stop using the the term “swine flu,” claiming the term was misleading consumers and causing some countries to slaughter pigs needlessly. The WHO will call the virus by its technical name, H1N1 influenza A. As countries around the world debate over what to call “swine flu,” Worldfocus anchor Martin Savidge writes about the influenza name game. A couple of days ago when the flu story was really beginning to move, I remember seeing a report from Israel on the wires about how many Jews wanted the name of the outbreak changed because it was offensive to their faith. Muslims, as well, wanted a different name for the same reason. I thought that was rather amusing and potentially confusing. Then I read yesterday that the U.S. government wanted to make a name change as well — but it had nothing to do with faith; rather, the economy. Specifically, the negative impact “swine” flu was having on the pork industry. Pork farmers fear the market could take a dive, perhaps with good reason. Even though scientists have said there is no way to catch the flu by eating pork chops or any other pork products, a number of nations have moved to ban the importation of pork from the U.S. and Mexico. They include the Philippines, Kazakhstan, Ukraine and Ecuador. In Jordan they are shutting down pig farms, while Egypt has ordered every pig in the country destroyed — some 300,000 of them. In the newsroom, we were struck that Muslim countries like Egypt and Jordan would even have pigs as livestock. As our associate producer Mohammad al-Kassim pointed out, it’s for their Christian residents, who have no religious problem with ham or bacon. So what name should replace “swine,” since it is so problematic? The U.S. suggests referring to the flu as H1N1, its scientific name. Thailand says it will start calling the disease the “Mexican flu” — a name Israel liked as well — but not one that Mexico is likely to like. In Europe, Androulla Vassiliou, the European commissioner for health, said that the commission would refer to the disease as “novel flu.” I don’t quite get that name. Is it because this is said to be a totally new flu? The WHO continues to refer to the virus as swine influenza. Meanwhile, the World Organization for Animal Health, which handles veterinary issues around the world, issued a statement suggesting that the new disease should be labeled “North American influenza,” in keeping with a long medical tradition of naming influenza pandemics for the regions where they were first identified, e.g. the Spanish flu of 1918 to 1919, the Asian flu of 1957 to 1958 and the Hong Kong flu of 1967 to 1968. So what name would you call it? It’s worth noting that this is another story, like the economic meltdown, which shows how we are all globally connected. And like the recession, the only way to combat the problem is by working together. No one is immune — regardless of where you live or what language you speak. Photo courtesy of Flickr user The Pug Father under a Creative Commons license. Maybe we should call it the media flu on the account of how it’s always on the news. Why don’t we all refer the H1N1 flu as “that flu” or “that 09 flu”? No one globally should be offended. Early on in the coverage of this news story it was mentioned that this new flu strain combined genes from human, avian and swing flu. Later I saw a story where a hog farmer suggested that this flu strain be refered to as the hybrid flu which makes sense to me.